Individual plated desserts make for a more upscale presentation but this one doesn’t require more labor. For the no-roll crust, pastry chef Glass of Stephen Starr Catering Group pulses walnuts with butter, maple syrup and brown sugar in the food processor and presses the mixture into small tart pans. Fresh strawberries and whipped cream create the filling. 1. Preheat oven to 375 F. In food processor, pulse together walnuts, butter, maple syrup and brown sugar until crumbly. Divide mixture among 3-inch nonstick tart shell molds, pressing into bases evenly. 2. Bake tart shells 13 to 15 minutes until fragrant and golden brown. Let cool and remove from molds. 3. 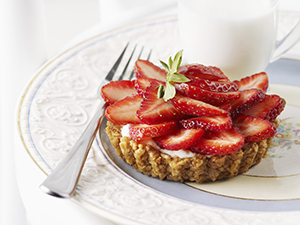 In medium bowl, combine diced strawberries with liqueur; spoon 1/4 cup into the base of each tart. 4. Pipe or spoon some whipped cream onto each tart. Cut strawberries into slices and divide on top. Serve immediately.